The climate's "new normal" for most of the coming century will parallel the long-term drought that hit western North America from 2000 to 2004 - the most severe drought in 800 years - scientists report in a study published Sunday. Triple-digit heat intensified across Arkansas on Monday, setting records in at least two cities and increasing the danger for wildfires. Temperatures exceeded 100 in some areas, and are expected to stick around for much of the week. Low humidity also is settling in, increasing the threat for wildfires. The daytime high reached 111 degrees in Little Rock, which not only broke the date's record but marked the third-highest temperature ever recorded in the state's capital city. The previous record for July 30 was 108 degrees in 1986. Little Rock reached 114 degrees last year on Aug. 3, the city's hottest day in 132 years of records. The city's second-highest temperature on record occurred July 31, 1986, when it hit 112 degrees. Also Monday, a record was set in Jonesboro, where the mercury peaked at 104, a degree higher than the record set in 1986. 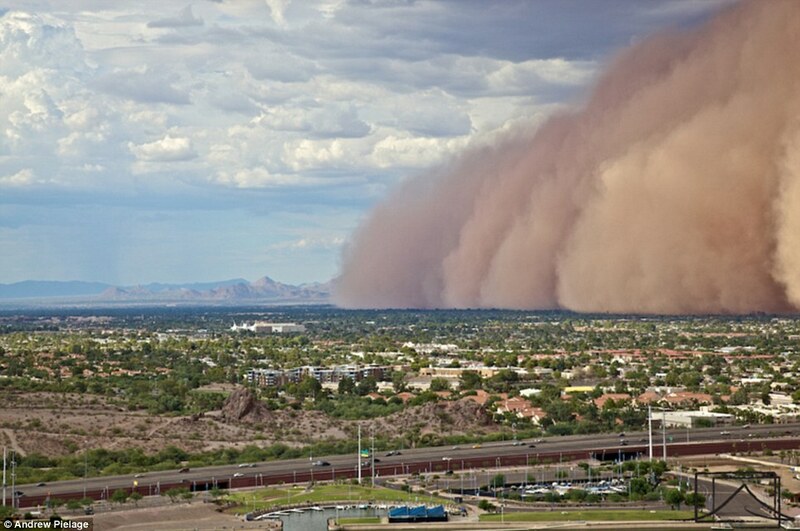 Phoenix covered in blanket of dust for second time in a week as massive cloud rolls in from desert. A second cloud of yellow in less than a week overwhelmed suburban Phoenix on Sunday, mixing with torrential rains and gusty winds that wreaked havoc on midday traffic in the area. 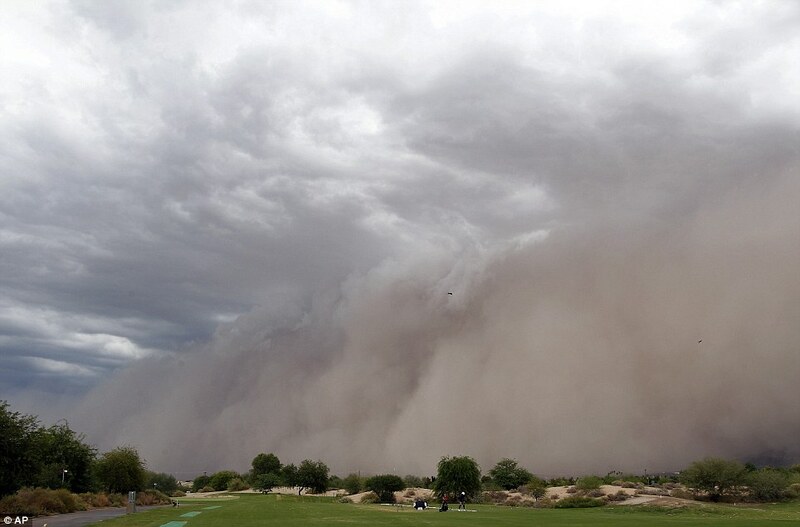 The thick wall of dust, known as a haboob, which is Arabic for 'strong wind,' was seen making its way through the town of Laveen about eight miles southwest of downtown Phoenix. The greater Phoenix area and northwest and north central Pinal County were under a dust storm warning that expired at 7pm on Sunday. This comes just days after an enormous dust cloud measuring around 2,000 feet tall and almost 100km wide swept over the city, traveling at 35mph. 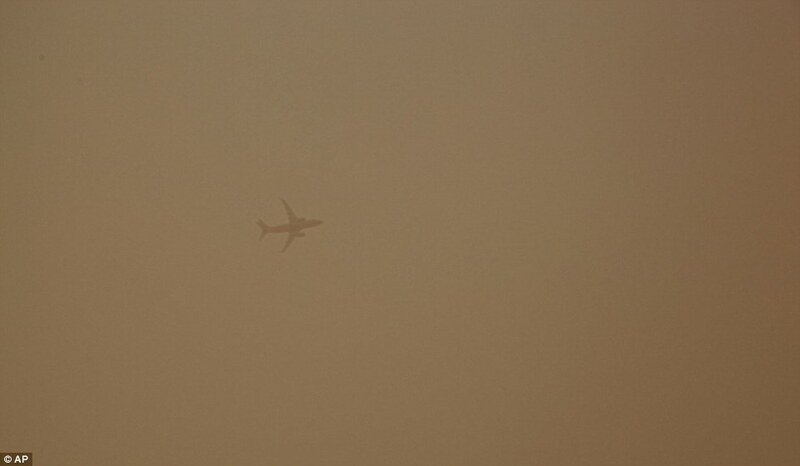 The dust cut power to some 9,000 homes and caused disruptions at the local airport. 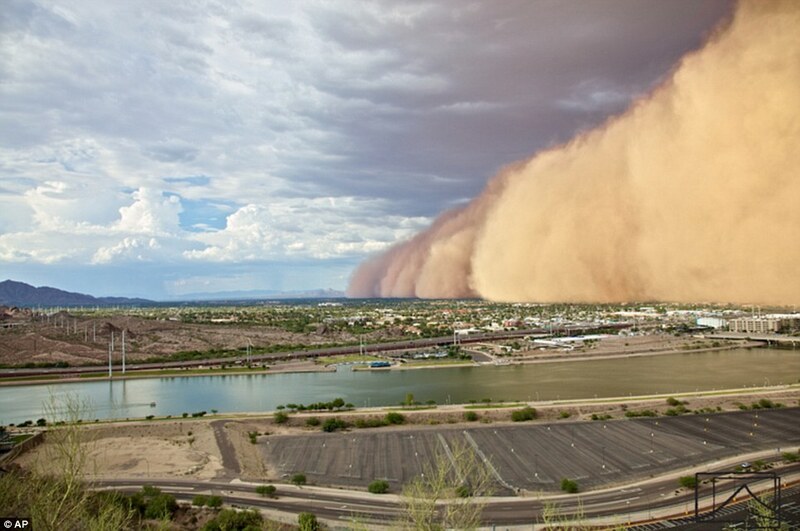 Caused by Arizona's monsoon season which begins in early June and runs through till the end of September, haboob's only occur in Africa, the Middle East, Australia and Phoenix, Arizona. Known as the granddaddy of dust storms, the haboob is a rare event and is caused by loose dust being blown upwards in the absence of rain and collecting skywards where it is then propelled by another more distant thunderstorm brewing behind it. Despite some of the 1.5 million residents of Phoenix objecting to the term haboob being used, meteorologists in the city confirmed that they have been using the Arabic word to describe the massive dust storms for over 30 years. 'I think what's going on is that we've had a higher frequency of stronger dust storms over the last couple of years and the term has been in play much more because of that,' said Ken Waters of the Phoenix National Weather Service office to KPHO. 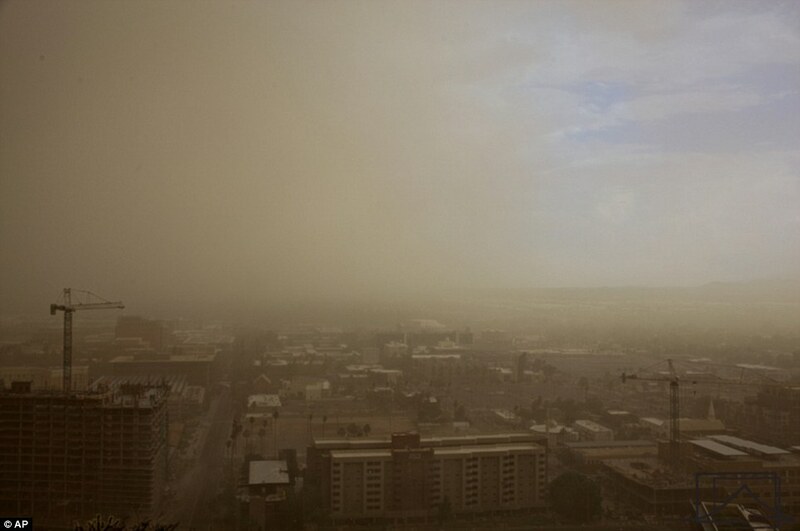 Blowing gusts of up to 50 mph at Phoenix Sky Harbor Airport, the haboob is destructive because of the fine dust particles that manage to permeate everywhere during the storm. 'The dust gets into everything ... It gets into electronics, it gets into every nook and cranny,' said Penn State University meterologist Fred Gadomski to NPR. Familiar to millions of movie-goers from films such as 'The Mummy' or 'Hidalgo', the Haboob was witnessed by Phoenix New Times freelance photographer Andrew Pielage, who watched the storm unfold from a mountain viewpoint. 'It is one thing to see it from the ground, but when you are on top of a mountain and you still have to look up to see the top of it you really start to grasp the size and magnitude of the haboob,' said Pielage to the Examiner.com. An Arizona researcher who studies haboobs said there could be hidden health impacts for millions of people living in the state’s dust zone. 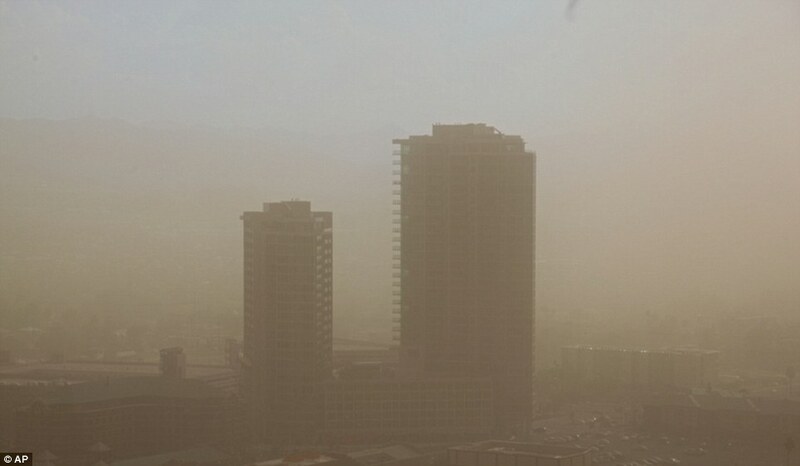 According to William Sprigg, of the University of Arizona’s Institute of Atmospheric Physics, dust storms carry a noxious mix of fungi, heavy metals from pollutants, chemicals and bacteria that could lead to cardiovascular and eye disease, and other illnesses. Remember the fires and drought of just 2 years ago? Russia is currently in the grips of an extremely strong heat wave. City and town residents are suffocating from the sweltering heat. For example, it is about 30 degrees in Moscow with prospects of the thermometer going up in the next few days. The heat wave situation is aggravated by wild fires producing clods of poisonous smoke. 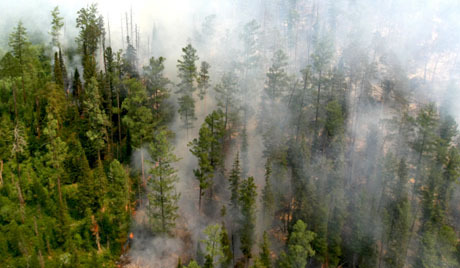 The wood rich Siberian taiga near Krasnoyarsk is fighting 83 fires on the territory of 12.130 hectares. As for rural Russia, that only last year was the world’s third-biggest grain producer, it suffers colossal damages. It threats to destroy a significant part of the crops. 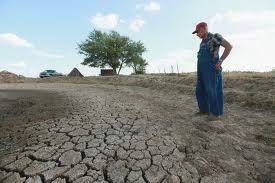 If last year’s harvest amounted to 94 million tons, this year it is a predicted at 80 to 85 million. Given the situation, earlier in July the Agriculture Ministry had to revise its harvest predictions. As Rossiyskaya Gazeta writes, the hardest hit are the important grain-producing areas including Kuban, Stavropol, Volgograd, Volga, Rostov-on-Don, Lipetsk, Penza, Ulyanovsk, Kurgan and Altai. Nevertheless, Arkady Zlochevsky, president of the Russian Grain Union thinks that “The risks are there, but then there is a chance to avoid them.” Zlochevksy added that there will be 85 million tons of crops and the size of the harvest would depend on the weather. With the leftover stocks from previous harvests, the export potential will then be about 18-20 million tons. Although this is less than last year, when the country exported more than 26 million tons, it is still better than 2010, when the droughts and wild fires in Russia ruined about a third of all the grain harvested and the country had to impose an embargo on grain exports. The area of Russia’s irrigated fields is about 2.5 million hectares, and Russia has 44 million hectares of land under spring crops this year. “The biggest losses are not caused by the weather, it is rather the failure to comply with production rules in bad weather,” said Zlochevsky. His forecast is worrisome as Russia’s annual domestic consumption amounts to 67 million to 72 million tons. As is expected this year Russia may consume up to 68.5 million tons of grain and so, considering the remaining stocks from previous years, Sukhanov’s institute colleagues are putting the Russian grain export potential this year at a mere 13.5 million tons. If so, that would be all we will be able to sell to our traditional buyers of grain in the Middle East and North Africa, and some Southeast Asian countries that joined them last year. “But this is not a long-term trend. Next season, Russia might have a good crop and again become a leader among world grain exporters,” Sukhanov said. Despite the poor forecast for this year, Russia has ambitious plans for increasing its grain exports. The new edition of the national program for development of agriculture for 2013-2020, adopted in early July, set a target of a 115-million-ton grain harvest by 2020, which should bring Russia within reach of the United States, the traditional leader on the global grain market. The current Russian predicament begins to tell on the world prices. Although there is no acute grain shortage in the world, other major grain producers, including the United States, Ukraine, Kazakhstan and China, are experiencing some problems. Forecasts in these countries account for the current high grain prices, about $330 per ton of food wheat. Sukhanov believes global grain prices could rise by another 10 percent before the year is out. However, our experts do not believe that this will make a big difference in the prices of bread, meat and other staples because the share of grain in the end product is small. For example, in Russia, grain accounts for only 23 percent of a loaf of white bread. July 31, 2012 – FINLAND – The mercury rose to over 30 degrees Celsius for the first time this summer in eastern Finland as meteorologists warned of severe thunderstorms later in the day. The temperature exceeded the 30-degree mark in Tohmajärvi, Lieksa and Juuka in North Karelia, close to the Russian border. But the Finnish Meteorological Institute (FMI) says that a cooler weather front has already arrived in western Finland and will start moving eastwards soon, making the current heatwave quite short-lived. Severe thunderstorms are expected to whip up very strong wind gusts on Monday, warns the FMI. Winds may reach speeds of 25 meters per second in North Ostrobothnia and western Finland, and elsewhere in the country gusts of some 15 m/s are expected. Additionally, heavy rainfall is forecast for various parts of Finland on Monday. 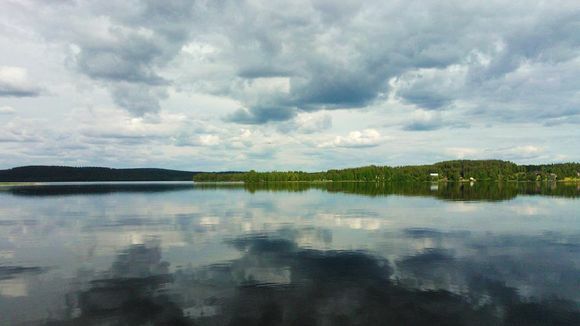 Thunderstorms left thousands without electricity in different parts of Finland on Sunday. Most of them had been fixed by Monday afternoon. At 1pm, some 200 Fortum customers were still without power. Elenia (formerly known as Vattenfall) had about 1,200 customers without service at that time. The heat wave affecting much of Italy has resulted in an average 10% reduction in national milk output, according to the Italian agricultural union Coldiretti. In some regions, more severely affected, this is as high as 50% down. Dairy farmers are taking steps to cool their cows, including the use of fans in barns and sprinkling the animals with light jets of water, it said. Corn, tomato, beet and sunflower crops have been damaged across the country and some areas have received no rain for months, the Rome-based agricultural union said in an e-mailed statement today. Chairman of the Federal Reserve Ben Bernanke thinks gold maybe better than Libor rates after all. US Secretary of State Hillary Clinton joins al-Qaida in Syria. We also talk to Meredith Alexander, Policy Chief at Action Aid, about why she resigned as a London Olympics 2012 Commissioner over sponsorship of the London games. These and much more are all reviewed in this edition of Double Standards with Afshin Rattansi. Dozens of disabled kids affected by the 1984 Bhopal disaster, one of the world’s worst-ever industrial catastrophes, have held their own Games to protest against the London Olympics sponsorship by Dow Chemical. The children, aged five to 16 and cheered by their nearest and dearest, have participated in 10 sports in Bhopal during the “Special Olympics". The move was aimed to attract attention to the responsibilities of the company, which has a contract with the IOC until 2020 and, in particular, is a sponsor of London Olympics. Dow Chemical has repeatedly denied any involvement in the tragedy and refuses to add to the $470-million compensation paid out in 1989. The Bhopal "Olympics" kicked off with children suffering from cerebral palsy, partial paralysis and mental disabilities parading in wheelchairs and walking with the assistance of others around an outdoor stadium in the shadow of the old pesticide plant. One of the competitions was called "the crab walk": three children who were unable to stand propelled themselves down the 25-meter racecourse with their hands. And one little boy was running back and forth on the field even when no race was on. "The children are born like this because of the gas," Kesar Bai, a 45-year-old mother from a slum near the old pesticide plant, told AFP. She firmly believes that the disaster and its long-standing influence caused her son Pratap's severe cerebral palsy. "I was thinking 'If there hadn't been this tragedy, then so many would not be born like this'," she said, adding that in the area around her shack there were 10-12 ill kids. Jamila Bi brought her wheelchair-bound 11-year-old grandson Amaan to take part. "Today these children are participating, in spite of what Union Carbide did to them," Bi told AP. "We are happy that they will walk. Those people will see that in spite of what they did these children are still participating." Some 25,000 residents of Bhopal died in the aftermath of a massive 1984 gas leak in a pesticide factory owned by the American company Union Carbide. Immediately after tonnes of toxic gas leaked, survivors remember the slums surrounding the pesticide plant being packed with people, many unconscious, vomiting or frothing at the mouth. "We woke up at 2am in the night. Everyone was running. If you fell down, they ran over you," Bai remembers. In 2001, Union Carbide liable for the disaster was purchased by Dow Chemical. The latter, however, has done little to improve the situation in the disaster-stricken zone. According to activists’ estimates, 500,000 people are still suffering from illnesses developed after the tragedy, including cancer, blindness and various birth defects. "We have been protesting against Dow's sponsorship [of the Olympic Games] for a year now; we want them to be dropped," organizers' spokeswoman Rachna Dhingra told Reuters. "But we have realized this is not going to happen." The team of scientists based at the University of California, Berkeley, gathered and merged a collection of 14.4m land temperature observations from 44,455 sites across the world dating back to 1753. Previous data sets created by Nasa, the US National Oceanic and Atmospheric Administration, and the Met Office and the University of East Anglia's climate research unit only went back to the mid-1800s and used a fifth as many weather station records. The funding for the project included $150,000 from the Charles G Koch Charitable Foundation, set up by the billionaire US coal magnate andkey backer of the climate-sceptic Heartland Institute thinktank. The research also received $100,000 from the Fund for Innovative Climate and Energy Research, which was created by Bill Gates. Unlike previous efforts, the temperature data from various sources was not homogenised by hand – a key criticism by climate sceptics. Instead, the statistical analysis was "completely automated to reduce human bias". The Best team concluded that, despite their deeper analysis, their own findings closely matched the previous temperature reconstructions, "but with reduced uncertainty". Last October, the Best team published results that showed the average global land temperature has risen by about 1C since the mid-1950s. But the team did not look for possible fingerprints to explain this warming. The latest data analysis reached much further back in time but, crucially, also searched for the most likely cause of the rise by plotting the upward temperature curve against suspected "forcings". It analysed the warming impact of solar activity – a popular theory among climate sceptics – but found that, over the past 250 years, the contribution of the sun has been "consistent with zero". Volcanic eruptions were found to have caused short dips in the temperature rise in the period 1750–1850, but "only weak analogues" in the 20th century. "Much to my surprise, by far the best match came to the record of atmospheric carbon dioxide, measured from atmospheric samples and air trapped in polar ice," said Muller. "While this doesn't prove that global warming is caused by human greenhouse gases, it is currently the best explanation we have found, and sets the bar for alternative explanations." Muller said his team's findings went further and were stronger than the latest report published by the Intergovernmental Panel on ClimateChange. In an unconventional move aimed at appeasing climate sceptics by allowing "full transparency", the results have been publicly released before being peer reviewed by the Journal of Geophysical Research. All the data and analysis is now available to be freely scrutinised at the Bestwebsite. This follows the pattern of previous Best results, none of which have yet been published in peer-reviewed journals. Early indications suggest that climate sceptics are unlikely to fully accept Best's latest results. Prof Judith Curry, a climatologist at the Georgia Institute of Technology who runs a blog popular with climate sceptics and who is a consulting member of the Best team, told the Guardian that the method used to attribute the warming to human emissions was "way over-simplistic and not at all convincing in my opinion". She added: "I don't think this question can be answered by the simple curve fitting used in this paper, and I don't see that their paper adds anything to our understanding of the causes of the recent warming." 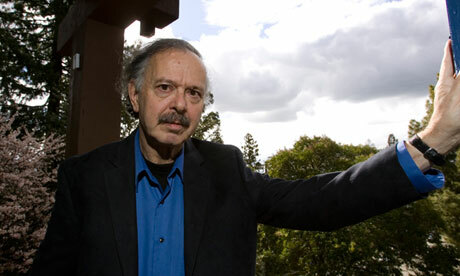 Prof Michael Mann, the Penn State palaeoclimatologist who has faced hostility from climate sceptics for his famous "hockey stick" graph showing a rapid rise in temperatures during the 20th century, said he welcomed the Best results as they "demonstrated once again what scientists have known with some degree of certainty for nearly two decades". He added: "I applaud Muller and his colleagues for acting as any good scientists would, following where their analyses led them, without regard for the possible political repercussions. They are certain to be attacked by the professional climate change denial crowd for their findings." Muller said his team's analysis suggested there would be 1.5 degrees of warming over land in the next 50 years, but if China continues its rapid economic growth and its vast use of coal then that same warming could take place in less than 20 years. History is being made in the North Sea, as China makes its first significant investment in its oilfields through two major deals. State-controlled energy giant CNOOC last Monday unveiled a $15.1bn (£9.7bn) bid for Canada’s Nexen, the second biggest oil producer in the North Sea. If successful, the takeover will be China’s largest ever foreign investment. That same day, Chinese refiner Sinopec said it would pay $1.5bn for a 49pc stake in the UK unit of Canada’s Talisman Energy, also a top 10 oil and gas producer in the North Sea. Still, money is not the only consideration in purchases of this kind, which will have to be signed off by the UK Government, among other authorities around the world. Eyebrows inevitably raise at the political niceties of having North Sea energy reserves in the hands of Beijing. Consultancy Wood Mackenzie calculates that together the two Chinese firms will directly own 13pc of all UK oil production if both deals go through. But for all the nervousness around China buying up local energy assets – urged on by a Chancellor looking outside the UK for much-needed investment – the reality is that Beijing is looking at a bigger picture. After all, production from the North Sea oilfields peaked years ago, a change accompanied by a shift from bigger to smaller operators. The thinking is that China has not been seen in the North Sea so far, because it has not viewed the reserve potential as big enough. There is also another consideration. From Beijing, political risk looks rather different to someone working out of say, London, or Washington. For China, the high tax rates levied on North Sea oil producers are not offset by the sweetener of operating in a country seen to be, in Western eyes, without much political risk. So what has changed, to make the Chinese want to take a dip? Nothing much for CNOOC, suggests Alex Grant, managing director of oil & gas investment banking at Jefferies. “I don’t think that [getting into the UK] was the driver for the deal – although the question now is whether they will seek to expand on their position,” he says. Nexen, he points out, has significant assets across Canada, Nigeria and elsewhere. The Sinopec deal looks different, however. Through that purchase the Chinese are clearly getting into UK waters deliberately. The driving force is that China is moving from a focus on untapped reserves to assets that are up and running, Grant argues. The logic does make sense. After all, if you have bought oil reserves which need to be developed before production starts, the costs of rigs, drilling and manpower gobbles up your cash before you start to see any returns. So why not buy a few fields already producing to make your balance sheets look a bit better in the short term? The problem is that there is not an abundance of producing assets up for sale. Once an oilfield is in production there is little pressure to sell, as the profits cover running costs. In that light, the UK’s oilfields, declining and lacking in scale as they may be, look more attractive. Industry watchers do not rule out the possibility of more acquisitions by China in the North Sea as it looks to build up its producing assets, whether through smaller bolt-on purchases or more large-scale buys. That could signal opportunities for investors in the sector – provided that they back the right horses. As for the practicalities if the deals go through, major changes are not expected. Sinopec is buying into the North Sea through a non-operating interest, meaning Talisman will remain in charge. CNOOC, in contrast, will take over the show if it purchases Nexen. Still, the Chinese are well aware of the political sensitivities, so it would be a surprise if, say, CNOOC started cutting back on maintenance spending or do anything that might play into prejudices. That is not to deny the deals bolster China’s position in many ways. Just listen to the oil traders grumbling that CNOOC will be a step closer to information affecting crude prices, as Nexen’s Buzzard field plays a key role in setting prices for Brent, the benchmark London oil price. But do not hold your breath for this to stop the purchases getting the green light from the UK. After all, where else is the money going to come from? “They are both big credible companies, with good technical expertise and strong balance sheets,” says Grant, who does not expect them to be held up on the UK side. Israel and US talk war? Greek return to the drachma? Mish Shedlock interviewed by "Oil Price"